I use it on several of my websites, really good live chat app. Easy of use, great options, plenty of ways to customize and the best part for me is the fact that it is free, and if one needs to move past the free tier service, there are well priced options to choose from. You can only setup one free account per e-mail address, it would be nice to have at least three free users per e-mail. Specially for small companies, that are interested in providing this option on their websites. The software allowed pre-programmed responses that would save our agents much time when dealing with clients. It was overall easy to configure and use and it saved many clients as they didn’t have to wait for responses back to emails. This is no longer an issue but back when the software was owned by Zopim, it ran on flash ( years ago ) which would sometimes cause performance issues in my browser. This is no longer an issue . zendesk chat has easy to use interface.Also, you can integrate it into your website by following some simple steps. It allows you to interact with your clients on live chat and answer their queries in just minimum seconds. In free plan you can only serve one chat at a time. To serve concurrent chats you have to opt for their paid plan. I love that you can communicate in real time. This is so much better than using something free like Facebook message! Very good features and awesome! Just like any other zendesk at times it is difficult to get support but that’s ok considering you shouldn’t have many issues! Easy to use interface on your website to chat to web visitors. We signed up two new customers within a week by offering the option on our website to chat in real time. The setup was not as easy as I would expect, you would need some technical knowledge to setup the program. Very easy way to connect to your website visitors. Zendesk was founded by a group of three friends, Mikkel Svane, Morten Primdahl and Alexandar Aghassipour, in a Copenhagen loft, back in 2007. Currently based in San Francisco, Zendesk has been a publicly-traded company since 2014. The provider has also grown their expansion with major offices all around the world, and service available globally. Zendesk offers a suite of products that enables your business to provide the best customer experience possible, and to engage customers in the channels they prefer. Whether your business is looking to offer phone support, proactive campaigns, an online knowledgebase, chat support, or is looking to organize the mass amounts of customer data collected, Zendesk’s platform covers it all. Overall the platform is known for not only covering a wide array of functionalities, but also its ability to integrate with a wide array of existing technologies like CRMs and web apps. The provider has won numerous accolades for innovation, and has made a number of acquisitions aimed towards enabling companies to provide superior customer service. 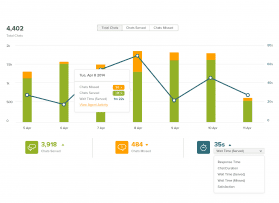 Zendesk made waves back in 2007 when they first released their customer service platform. 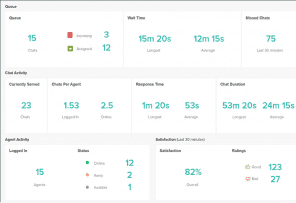 Built to address the shortfalls of existing call center solutions, Zendesk’s unique approach expanded functionality to handle live webchat while providing organizations with the tools they need to appropriately interact with customers, maintain relationships, and organize data. Their entire suite of products includes everything your business would need to provide a modern support experience, including integrated customer support, an online knowledgebase and guides, Live Chat, telephony service, proactive campaigns, and even analytics and reporting. However, that does not mean your business must subscribe to every single solution offered by Zendesk. Instead, your business can decide which pieces fit into your specific puzzle best. With their Live Chat solution, Zendesk offers businesses a powerful service to directly integrate a real-time, live chat widget into both their website and mobile applications. Of course this is standard in the industry, but Zendesk’s unique take provides a solution that is as easy to use, as it is powerful. With a compelling pricing structure, Zendesk offers a Live Chat solution that can fit into the needs of any business of any size, even offering the one-man entrepreneur service with their free plan, known as Lite. Even working your way up market, towards the Enterprise solution, and pricing stays competitive. While the free Lite plan is limited to only 1 concurrent chat and 30-days of history, the service really comes into its own even with just the first paid plan, Team. 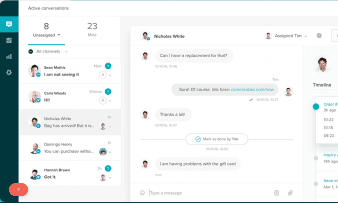 This solution provides unlimited chats, 2 departments, and even widget customization — a functionality normally reserved for the most expensive plans. Of course, the power behind Zendesk’s protfolio is the collection of different products and solutions into one platform. However, even as a stand-alone option, Zendesk Live Chat is a compelling solution. Zendesk’s proven history of innovation, quality products, and a clear vision of a simple user experience can absolutely be felt even within their Chat application. Zendesk has since spawned many imitators, but not many come close to what the provider offers. What Do You Think of Zendesk Chat?